Are you a working senior? If you are working for yourself, or you own a business, you may be wondering how your work and your social security benefits interact. 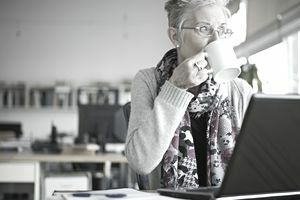 While seniors who are self-employed face some of the same tax and benefit issues as other small business owners, they also have to deal with some additional circumstances relating to social security and Medicare. More Baby Boomers are postponing retirement and going into business for themselves, or continuing in business. The Small Business Administration says that the number of seniors who work has increased; the percentage of individuals age 62 and over who were self-employed increased from 4.2 percent in 1988 to 5.4 percent in 2015. For the purposes of this article, we will consider someone self-employed if the individual owns a business, has business income and expenses, and is filing a business tax return. In most cases, self-employed individuals file their business income taxes using Schedule C as part of a personal tax return. If you have income, you must report it to the IRS and pay taxes on it. Your self-employment income is added to your personal tax return along with other income, including any social security income you may receive. You may continue to work in your business and still collect social security benefits, but these benefits are limited if you exceed the maximum taxable earnings amount each year until you reach your normal retirement age. If your total income for the year, including employment and self-employment, is greater than the maximum allowed by Social Security, your Social Security benefits will be cut at the rate of $1 for every $2 of income over the maximum. Beginning with the month you reach normal retirement age (age 66, if you were born between 1943 and 1954), you can earn as much as you want and not have to pay back any Social Security benefits you receive. Your self-employment may also increase your social security benefit, depending on the amount of your income compared to other years of employment. The Social Security Administration (SSA) is notified by the IRS of your income and additional credits may be calculated. Check with your local Social Security office for more questions about how your self-employment may affect your future Social Security benefits. Even though you may be receiving social security benefits, if you work for someone else or have your own business, you must still pay social security and Medicare taxes, called self-employment taxes. Crazy, I know. How you pay these taxes depends on your status. The most important thing to remember about self-employment taxes: This tax isn't deducted from your income as a business owner. You must calculate the self-employment tax you owe and pay this amount with your taxes. Many business owners pay estimated taxes quarterly to avoid penalties for underpayment. You will need to report business income from Schedule C by adding this income to their personal tax return income. Business owners must also report business earnings on Schedule SE, for earnings over $400 a year. Schedule SE calculates self-employment taxes (Social Security and Medicare tax on self-employment income. The Social Security self-employment tax rate changes each year. The current rate.is 15.3% on all income up to the social security maximum (this rate increases every year). The self-employment tax rate is 2.9% (Medicare only) above the social security maximum; there is no maximum on Medicare tax. If you have income from employment and also from self-employment, the employment income is counted first, if you go over the maximum income. Your net earnings from self-employment are reduced by half of your total Social Security tax. This reduction is to bring self-employed individuals in line with the one-half of Social Security paid by employers for employees. This deduction is taken on Schedule SE. In addition, you can deduct half of your Social Security tax on Form 1040, to reduce your adjusted gross income. Remember that you must pay both income taxes and self-employment taxes on the net income from your business, even if you are currently receiving Social Security benefits. Your net earnings from self-employment, for Social Security purposes, are your gross earnings, minus allowable business deductions and depreciation. Some other income is not included for Social Security; for this list, see "If You are Self-Employed" (below). In 2010, the IRS began to allow self-employed people to deduct Medicare Part B health insurance premiums from self-employment income. The deduction is taken on Line 29 of your Form 1040. Any self-employed person, regardless of age, can deduct the premiums they pay for health insurance, under certain conditions. One is that the insurance must be established in the name of the business or - in most cases - the name of the person running the business. Health insurance may be deductible for small business owners. Read more about how to find health insurance for self-employed seniors.